As someone who likes to sketch, I really enjoyed Helen Birch's earlier book Freehand: Sketching Tips and Tricks Drawn from Art that was filled with lots of ideas, techniques and fun stuff to try out. In this new book Just Add Watercolor, Birch has retained the same presentation format. On the left page there's the writeup and the right a piece of artwork from the featured artist. The book's just slightly thinner at 208 pages compared to the earlier one. It's still around A5 size. 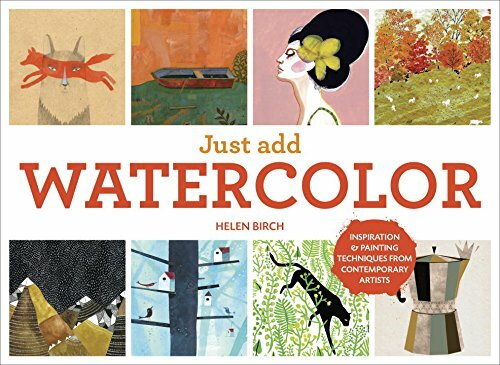 Besides watercolour, the book also covers a bit on mixed media, but mostly used with watercolour, media such as gouache, non-paper media, other water-based media, and digital. What I like about the book is it covers a mixture of techniques and artistic style. There are lots of interesting ideas on how watercolour can be used to create certain styles. For example, you could work in monochrome, use stencilling, use only secondary colours, explore ink blooms or colour shifts, paint imaginary landscape, use with gouache or acrylic. Those are more techniques oriented. Then there are the many ideas on what you can draw. The writeup talks about the techniques used in the featured artwork, and also provides a tip that you can try out. You can flip to any page in the book and try something different you've not tried before, either a new technique or a new style. 74 artists are featured and their beautiful artworks look contemporary to me, more of the illustrative style rather than the traditional landscape or portrait look. There's a nice variety. A full list of artists and their websites are provided at the back of the book. By the way, there are two publishers for the book, Watson-Guptill and Frances Lincoln. The one where the title is 'Watercolour' is from Frances Lincoln, and 'Watercolor' is from Watson-Guptill. They distribute in different countries, and price varies. The book's also available in Kindle format on Amazon. Since there are artworks involved, you would get more satisfaction by reading it on an iPad rather than on a black and white Kindle - watercolours is about colours! Overall, it's a great book for those looking for inspiration. I would highly recommend getting it with the Freehand artbook. One can't have too many books on inspiration.